The world’s two most famous colours merge on original black and white canvases. Artwall and Co proposes you a whole collection of black and white deco canvases to make your walls more beautiful with a design and contemporary touch. 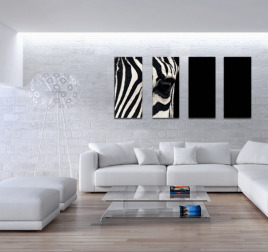 You will find different visuals of black and white photo canvases in unique and trendy abstract styles. Those low-priced modern canvases will easily fit in a lounge, a bedroom or a kitchen to become the centrepiece of the room. Trust Artwall and Co to make a black and white canvas fit in your apartment. 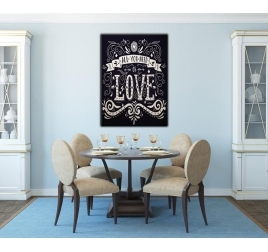 Romantic words for your better half on this low-price design canvas ! The dimensions of this contemporary canvas are 50 X 70cm. For the purchase of this abstract canvas, the 48/72h delivery is free in metropolitan France. Each printed canvas is waterproof and treated anti-UV. Life is beautiful, and this decorative art print reminds us that we should all follow some basic rules to make this saying true. This black and white art print is 80 x 60 cm (31.50 x 23.62 po). Free delivery within 48/72 hours in metropolitan France for this decorative canvas. Each design canvas is treated to withstand UV and moisture. An original canvas print representing two hands with visible veins. 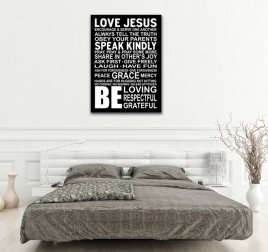 This decorative canvas is 70 x 70cm (27.56 x 27.56 po). Free delivery within 48/72 hours in metropolitan France for this abstract art print. Each modern art print is treated to withstand UV and moisture. 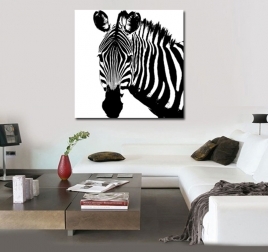 This animal art print stares at you through this splendid zebra's eyes! Each panel of this modern polyptych is 25 x 55 cm (9.84 x 21.65 po). Free delivery within 48/72 hours in metropolitan France for this decorative art print. Each modern art print is treated to withstand UV and moisture.